come by the library to Search the extensive database. You may be surprised at what you learn about members of your family tree! 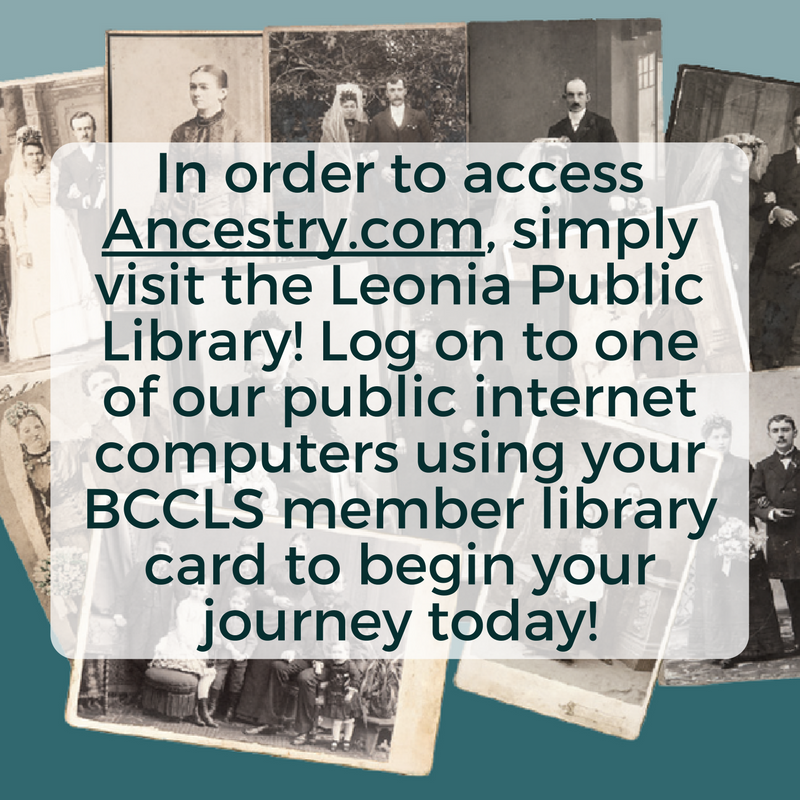 now available exclusively on leonia library’s public internet computers, ancestry.com is available for in-library use only. Visit the Leonia Public Library to discover your family tree! Ancestry.com is an online genealogy database. It contains billions of historical documents such as census records, military records, and immigration records as well as pictures, city directories and maps which can be searched to help you discover your family’s history! How do I access Ancestry.com? Use your BCCLS member library card—or ask for a guest pass—to log in for a one hour session on one of the libraries public internet computers located in the Adult Department. Click on the Ancestry icon on the desktop and begin your search! No password is required. make sure to save your finds! 2. Save it to your flash drive. Flash drives are also available for $5.00 at the Main Desk. 3. Email it to your personal email address. View the instructional video on Ancestry.com to learn how. Log on to our public computers to begin your journey! Find ancestors in the complete set of U.S. Federal Census images from 1790-1940. When did significant life changing events happen in your ancestor’s life? Search Ancestry.com's Vital Records to find out. Did your ancestors serve in the Military? Ancestry.com's collection of military records holds the answers. When did your ancestors arrive in the U.S. and how did they get here? Search Ancestry.com's passenger lists and other immigration records to learn more. Looking to jump-start your research? The experts at Ancestry have assembled a variety of tips and tricks to help get you on your way! Click on the Learning Center tab and select a topic. Access to this service at the Leonia Public Library brought to Leonia Public Library Patrons by a generous community donation.